Valerie Magar Meurs Coordinación Nacional de Conservación del Patrimonio Cultural, INAH. This article raises questions affecting cultural heritage conservation today that have already been covered in Riegl’s and Dehio’s texts written at the beginning of the 19th century. It deals with the contradictions and the antagonisms concerning the conservation and restoration of cultural heritage. It also discusses the lack of clear definitions regarding concepts related to this field and the difficulties in implementing consensual policies for the preservation of heritage, as well as questions related to heritage education. It contemplates the conservation goals of cultural heritage and the divisions between theory and practice. It links the values assigned to the significance of cultural heritage for individuals. It presents Freud’s archaeological metaphors and an attempt to understand the questions that arise when dealing with cultural heritage conservation as seen through the optics of psychoanalysis. Botting, Wendy e J. Keith Davies (1994) “A Biblioteca de Freud e um apêndice de títulos relacionados a antiguidades”, in: Sigmund Freud e arqueologia: sua coleção de antiguidades, Salamandra, Rio de Janeiro, pp. 191-194. Dehio, Georg (2018) “La protección y el cuidado de los monumentos en el siglo XIX”, Conversaciones… con Georg Dehio, Alois Riegl y Max Dvořák (5): 29-44. 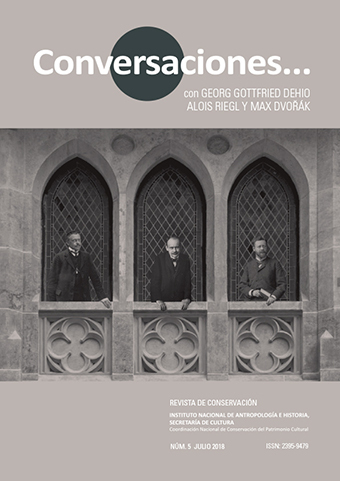 Dvořák, Max (2018) “El catecismo del cuidado de los monumentos”, Conversaciones… con Georg Dehio, Alois Riegl y Max Dvořák (5): 102-126. Freud, Sigmund (1996) “Construções em análise”, in: Jayme Salomão (org. ), Obras psicológicas completas de Sigmund Freud, Imago, Rio de Janeiro, pp. 271-283. Freud, Sigmund (1996) “Fragmento da análise de um caso de histeria”, in: Jayme Salomão (org. ), Obras psicológicas completas de Sigmund Freud, Imago, Rio de Janeiro, pp. 15-116. Freud, Sigmund (2011) O mal-estar na civilização, trad. Paulo César de Souza, Penguin Classics Companhia das Letras, São Paulo. Kuspit, Donald (1994) “Uma metáfora poderosa: a analogia entre a arqueologia e a psicanálise”, in: Sigmund Freud e arqueologia: sua coleção de antiguidades, Salamandra, Rio de Janeiro, pp. 159-177. Riegl, Alois (2018) “Nuevas corrientes en el cuidado de los monumentos”, Conversaciones… con Georg Dehio, Alois Riegl y Max Dvořák (5): 62-75.